Throughout the day, I can be found checking my Flickr account, making posts to my Pownce account, checking out videos on YouTube, chatting on GTalk, listening to music on Last.FM and reading news stories on Digg. But being an internet junkie and a big fan of all things “social web” or “social software” (the former “Web 2.0”), I’m very particular and I have strong convictions about which services I use and which services I declare to be something I wouldn’t be caught dead using. On my blog and other sites, I have lists and buttons and all sorts of nifty tools to badge myself properly to the things I use. But how would I show off my collection of “social web” services and sites when I’m not on the internet? Lucky for me, somebody already thought of the perfect way to do so out there in meat-space: the Are You Social T-Shirt. Since most social web platforms are not cross-linked with each other, it is difficult to follow which service and under which name a friend or acquaintance is registered. In the future identification platforms such as OpenID will attempt to provide help for this problem. At present, however, users still have to build a new network of friends on each separate service. In order to make life easier, smart users publish their membership as a list of icons of the corresponding services on their website or blog. 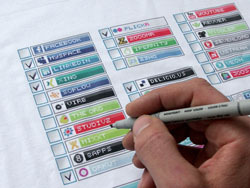 The T-shirt “Are you social?“ takes up this phenomenon and shows a list of the best-known social web services (as of 08/2007) with their icons and colours. The owner of the T-shirt is expected to mark the services he uses with a pen and to wear it in public. What happens when users start wearing their network identities openly in public? What does identity mean in the age of Web2.0? Where is this still growing mass of webservices leading to? People taking their love of Facebook or MySpace out into the real world? I guess people would have to stop being internet trolls if they have to look someone in the eye. Pick up a t-shirt in a short sleeve or long sleeve style (prices range from $16.90 to $25.90) at the project’s shop over at Spreadshirt.com. Is ASUS working on a Tablet Mac?